The Independent Care Review has appointed a group of experts in care to lead the work of the Journey stage, ensuring that the voice of care experience will continue to drive forward change for infants, children and young people in Scotland. Ten individuals with lived experience of the care system will play a major role as co-chairs of the third stage of the Care Review and will meet for the first time today. “The voice of people with care experience will always be at the centre of the work of the Independent Care Review, and I am absolutely delighted that the Journey stage co-chairs have agreed to get involved and lend their considerable skills and knowledge. 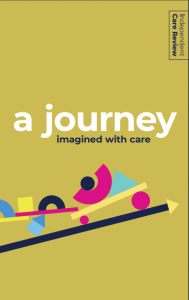 The Journey stage will feature a unique blend of care experience and professional knowledge, dedicated to better understanding how to improve Scotland’s care system. This clearly demonstrates that the Independent Care Review really is “a review like no other”. The Journey stage will highlight examples of good practice across Scotland, and identify those practices that should be improved. “The voices of infants, children and adults with care experience in Scotland must be heard at all levels of decision-making without fail. “Having spent time in care, I know from personal experience what it feels like to have my needs made subordinate to the wants of ‘the system’, to feel unheard and to feel unclaimed. Ashley Cameron, researcher for Kezia Dugdale MSP. Professor Nancy Loucks OBE, Chief Executive of Families Outside. Lisa Muirhead, Life Changes Trust intern and advisory board member. James Docherty, Development Officer within the Violence Reduction Unit. Sylvia Douglas, Founding Director of MsMissMrs CIC. Ewan Aitken, Chief Executive Officer of the Edinburgh Cyrenians. Beth-Anne Logan, Board member Children’s Hearings Scotland, Participation Assistant Who Cares? Scotland. John Carnochan OBE, former Detective Chief Superintendent and co-founder of the Violence Reduction Unit. Adam Bennett, The Fostering Network young champion. Gerald McLaughlin, Chief Executive of NHS Health Scotland. Jimmy Paul, Permanence consultant at CELCIS. Sue Brookes, former Governor of Polmont Young Offenders’ Institution.